Reader says he’s “grumpy” not “cranky”… how 2x4s got to be less than 2×4… the edible iPad revisited… and more! Well, props for honesty, I guess. But it’s about the most transparency you’ll ever get from one of the most opaque institutions on the planet, the Federal Reserve. Your editor was present last night as Minneapolis Fed President Neel Kashkari held a “town hall” meeting. 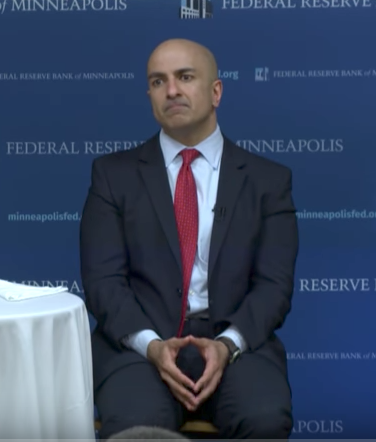 Kashkari performs this exercise in public outreach every few weeks somewhere in the Fed’s sprawling District 9 — stretching from Michigan’s Upper Peninsula 1,400 miles west to Montana. Heh. The contrast to Fed chair Janet Yellen couldn’t be more, umm, striking. Yellen’s audience was a bunch of fellow eggheads at the British Academy. At least Kashkari is trying to get out among real people — which history has shown can be a dicey proposition for a Fed pooh-bah. The most famous instance of public outreach by the Fed was also the most disastrous. In March 2011, New York Fed chief Bill Dudley ventured into Queens to meet with the hoi polloi. At the time, even the official inflation numbers were racing past 3% and the rising cost of living was on everyone’s mind. There were no “edible iPad” moments for Kashkari last night. Maybe that’s because he doesn’t fit the profile of the typical central banker. A second-generation Indian-American, he was an aerospace engineer by training before he got into the finance racket. He also came back to the plan he developed last year to break up the big banks, thereby mitigating the risks he admits still exist. That was the question I posed during the town hall, after consulting via email earlier in the day with Agora Financial’s macroeconomic maven Jim Rickards. Sure, I said, the Fed would quickly bring interest rates back down to near-zero levels. 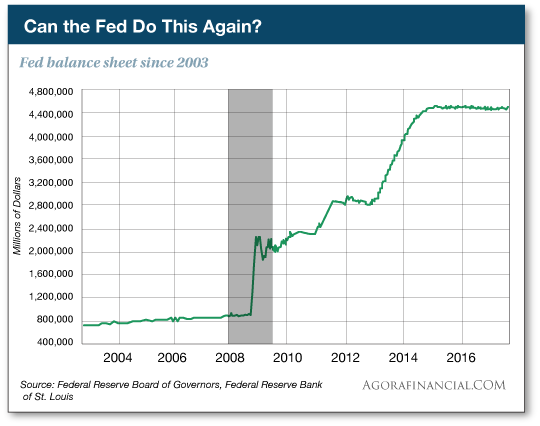 But does the Fed really have the capacity to add another $4 trillion to its balance sheet? Or would the liquidity have to come from some other source — such as the International Monetary Fund’s super-currency known as SDRs, or “special drawing rights”? That is, the torches and pitchforks will come out if the Fed embarks willy-nilly on a new round of money printing. From $4.5 trillion now to $8.5 or $9 trillion? Not happening. Especially not when the Fed is already leveraged more than 100-to-1. In a crisis, the liquidity to save the system will have to come from the only solvent institution left standing — the IMF. It will print SDRs in mass quantity to be distributed among the globe’s governments and central banks. You and I will continue to transact in dollars — but thanks to the proliferation of SDRs, those dollars’ purchasing power will shrink dramatically, and in a hurry. This isn’t Jim’s idle speculation; the plan was laid out in an IMF white paper in January 2011. Kashkari dodged this one too — as best he could. “I think the Fed still has a lot of tools in our arsenal,” he went on. He itemized them as follows: zero interest rate policy, or ZIRP. More quantitative easing. And forward guidance, which is Fed-speak for how the Fed jawbones the markets about its intentions. “A disappointing answer, but not too surprising coming from a Fed official,” Jim tells me this morning. A while back, Jim himself asked the same question of Timothy Geithner, Obama’s first Treasury Secretary… and got an equally unsatisfying answer. If you find this episode of The 5 a little unsettling — especially the part about “no imminent crisis” even though Kashkari admits central bankers do a lousy job of anticipating crises — you might want to take some of the precautionary measures Jim lays out for readers of Rickards’ Strategic Intelligence. If you’re not already among their ranks, you can follow this link and we’ll send you a hardback copy of his 2016 book The Road to Ruin, direct to your doorstep. To the markets today, which are regaining their bearings after dual jolts from — what else? — central bankers. If the idea was to talk down a sky-high stock market, it worked only for a few hours. As we write this morning, the S&P 500 is at 2,438 — about the same level it was yesterday before Fischer started working his mouth. Meanwhile, European Central Bank chief Mario Draghi declared that his money-printing efforts of recent years had conquered “deflationary forces” in Europe. That sent hot money flooding out of U.S. Treasuries, pushing yields way higher. This morning the yield on a 10-year note is back to 2.22%, the highest in a month. The greenback also sold off; the dollar index rests just above 96, the lowest since early October. Alas, that dollar weakness is not translating into gold strength; the bid remains mired just below $1,250. Time’s running short. We’d better dip into to the virtual mailbag. He goes on to challenge the way we characterized him. “I am grumpy, not cranky. “I noticed this with my dad, my uncles, my father-in-law and several other older friends. Men seem to get grumpy at age 68–70 and then mellow out around 76–78. I am not sure why. I will turn 70 in August and I admit that I am grumpy. “My family has been in the lumber business for over 60 years,” writes a reader weighing in on the lumber lawsuits that have hit Home Depot and Menards. “Once a uniform stack is made, it’s ready for the kiln. This is a building that is filled to the brim with rough green lumber. “Our dry kiln system had a boiler fired by bark and sawdust to make steam that traveled through pipes, and large fans blew the hot air through the spaces in the lumber stacks. Once the lumber was down to 19% (about 24 hours) it was sent to the planing mill. Here is where the sizing goes down to a uniform standard for lumber regulated by the government. “The knives on the planer cut out the rough saw marks and sizes it to a 1½x 3½ (2×4). So anything that is a full 2×4 is either rough green or a special order. When many of the older houses were built they were built from rough green lumber. The problem was that rough green lumber was bad to warp and twist. “When I first started buying lumber in the early 1950s 2x4s were 2×4,” writes our final correspondent. “But sometime later they did drop to 1½x3½. “Now it is plywood that is shrinking. About a couple of years ago I bought some 5/8” plywood to complete a project that I had started the year before. Turns out that the newer material was 1/32” thinner. Seems like that is the new standard. The 5: Yes, but the 2017 model of the iPad has a speedier processor and brighter screen for the same price as the iPad Air 2 it replaced. You just don’t appreciate Federal Reserve logic! P.S. Confidential to Canadian readers: On Friday you’ll be receiving a special email from us. We’re sending it to comply with new Canadian spam laws. The way the law works — at least as far as our legal eagles can figure it out — is that if you want to continue receiving The 5, you will have to actively sign up and send us your email address. This email we’re sending will make it as painless as possible, sending you to a signup page. Again, it’ll be coming your way on Friday. Oh, and Happy Canada Day on Saturday.